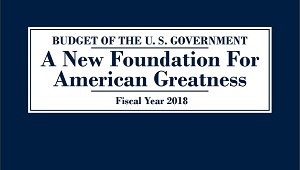 The White House on May 23 released an updated version of its proposed budget for fiscal year 2018, which gives a slightly more detailed look at the president’s budget priorities. Although Congress is not likely to pass this version of the budget, President Donald Trump’s budget preferences set the stage for what the major policy initiatives would be targeted in the new administration. The balanced budget proposal would allocate more money to the department of Defense, border security measures, law enforcement, veterans services, school choice, and a nationwide parental leave plan, according to Mick Mulvaney, director of the Office of Management and Budget. The budget allocates money for border security technology and infrastructure. The budget also supports cybersecurity efforts such as an increase in law enforcement and cybersecurity personnel across the Department of Homeland Security, DoD, and the Federal Bureau of Investigation to counter cyber crime; and an increase in funds for the National Cybersecurity and Communications Integration Center, which enables DHS to respond effectively to cyberattacks on critical infrastructure. The General Services Administration also received a major funding increase, going from an estimated $200 million in discretionary funding in 2017 to $500 million in the requested 2018 budget, possibly to account for the administration’s emphasis on IT modernization as a key component of national cybersecurity. 2018 budget request: $28.2 billion, up from $25.6 billion in the budget blueprint. 2018 budget request: $78.8 billion, down from $78.9 in the budget blueprint. Eleanor Lamb and Jessie Bur contributed to this story.